welcome in our forum. We appreciate that you made the effort using a translator. But you're welcome to post your question and answers in English. Many user are able to understand. 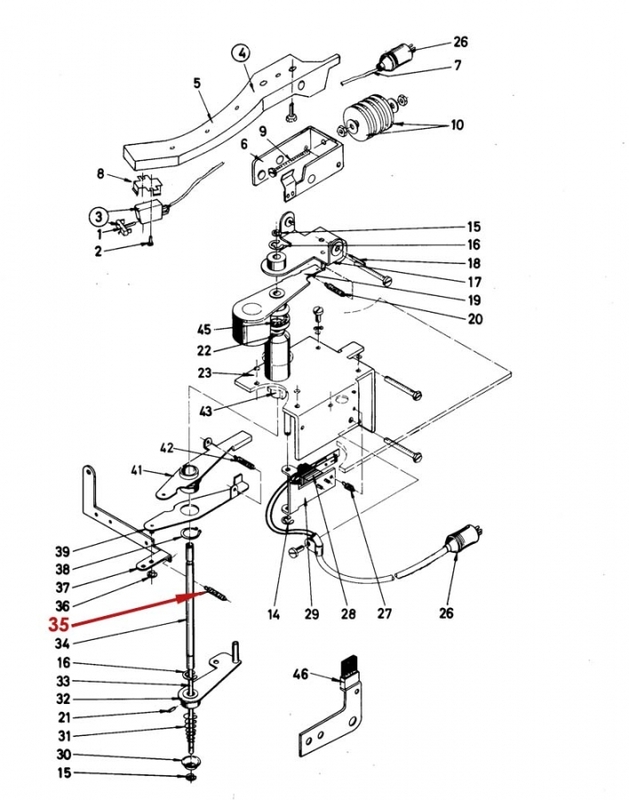 In your service manual on page 24 picture 47 shows the screw which adjusts the tone arm trip switch. When this adjustment is done right and still all records get repeated, then you might have a second problem: The jukebox doesn't cancel. The selected song gets cancelled when the tone arm touches the record in the beginning, not at the end of the record. Check your manual on page 31. I have looked at that figure in my service manual. While working on adjusting that screw, I have noted a tension spring that is loose at one end. I am having trouble figuring out where both ends attach. It also looks like the tension spring needs to be replaced as it is black and looks like it got burned. I don't have my manual in front of me but I think it was item number 26 or 27 in the exploded picture of the tone arm. I will have to get the manual as I think it gives an actual part number for this. Do you know anyone who carries these? can you identify the spring in this graphic (taken from a later manual)?